I wanted to write a post about intention setting, something that is near and dear to my yogi heart. 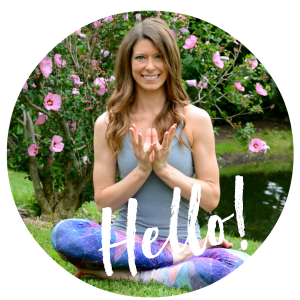 Intention setting has really transformed my yoga practice by allowing me to ensure that I get exactly what I need out of each yoga session. It helps me focus on what I need to accomplish and to let everything else go. So, I wanted to take the time to let you, my lovely readers, know about the power of intention setting and why you should give it a try. Every yoga teacher may have a different definition of intention setting, but to me, to set an intention for your yoga practice, you actively decide what exactly it is you need to get out of your yoga practice. Maybe there’s a feeling (gratitude, calmness, inner peace) you would like to focus on as you practice, or it could be something as simple as letting go of your thoughts. You take the time to decide what it is you need out of your practice, and commit to focusing on filling that need throughout your practice. You could say that intention setting is a form of meditation, in some ways. You release everything else your mind might want to focus on and instead focus on that one intention, just like you might focus on your breath in meditation. (Or, crazy thought: you could make focusing on your breath in your yoga class an intention for your practice that day!) That focus allows you to clear your mind of clutter so you can hone in on what’s really important to you in the moment. 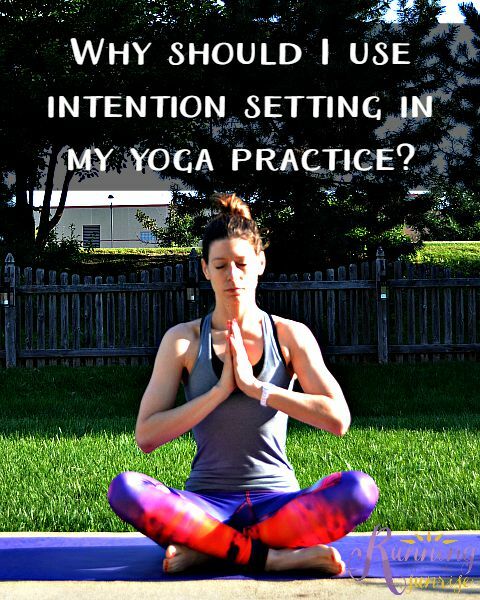 Why should I use intention setting in my yoga practice? For me, setting an intention really helps me stay focused in my practice. If I’ve been really stressed out, focusing on letting go and not letting whatever I’ve been worrying about creep back into my brain helps me find that moving meditation in my yoga practice that I need to release. We all come to our mats for different reasons, and setting an intention allows us to remind ourselves of what exactly it is we need out of our time on our mats so that ultimately our yoga practice is more effective. If you’d like to read more about why intention setting is so helpful, Yoga Journal also has a great Q&A about why we set intentions in yoga that you might find interesting. What’s lovely about practicing intention setting in yoga is that you can then apply it to your life outside of yoga. (The same is true about so many other things we learn during our yoga practice, too.) You could set an intention for the day to be kinder, or to not worry about the little things. If I happen to meditate in the morning, I’ll set an intention for the day at the end of my meditation session. Or, if I’m practicing yoga, I’ll set an intention when I’m in fetal pose, right before coming up to an easy seated position to finish my practice. My challenge to you: try setting an intention for your day, or even for the next hour or two. If you need to, write it down. Then, keep coming back to that intention and let go of anything that might come up that distracts you from that intention. See how it changes your life (and tell me about it in the comments or via email!). 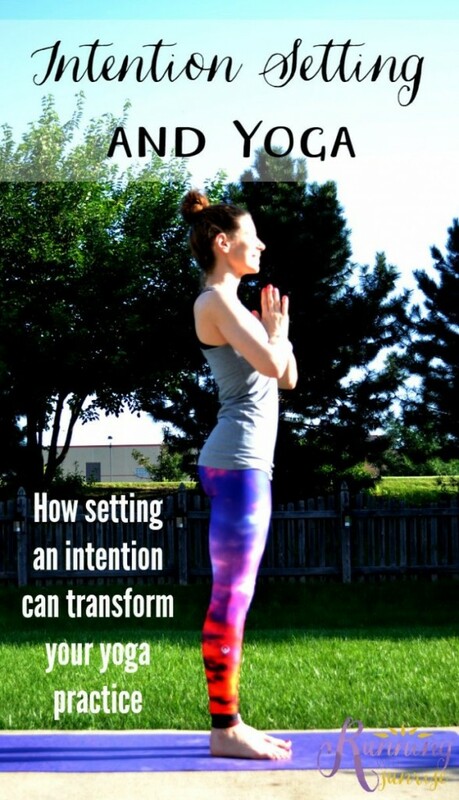 Yogis: do you use intention setting in your yoga practice? What intentions do you like to set for your day or workouts? Intention setting is something that, at first, I thought was a bit hokey and too hippie for me. But then I found the right setting for those intentions, and the right presentation. And sometimes they resonated with me dead on–I’ve written some posts on them–and sometimes they didn’t, so I went with my own. And that is the beauty of guided practice–you can be guided, but it is still YOUR practice. I know that feeling. I’m sometimes a little nervous to suggest intention setting in my yoga classes because I don’t want to make students feel uncomfortable or that I’m trying to make them do these crazy spiritual exercises (which intention setting is NOT, but I don’t want to turn them off with the misconception). And I am all about tailoring your yoga practice to YOU. It’s all bout what you need to get out of that hour, or however long you’re on your mat. Yoga taught me a lot about intentions. When I remember to (which should be more often) I’ll even set them for a run or a workout. It helps to keep me on track without getting lost and it will bring me back to what I’m doing. Yes, this. It’s so easy to get distracted and forget why we’re doing what we’re doing. Setting an intention helps us stay focused on the task at hand. I love this! I have some great instructors who are awesome about reminding us to do this before a practice, and it’s been really helpful. I should definitely start doing this before each run too! I love having the opportunity to set an intention at the beginning of class. It really does bring another dimension to that class. Love being able to focus on exactly what it is that I need to get out of class. Such a helpful post! I set intentions for my runs, both to help me stick to the specific goal of the workout but also to set the right tone for my day. I need to start doing this before yoga (and do more yoga, at that). Love this! Such a great idea to set an intention for other fitness activities, too. It really helps to keep your eyes on the prize! This is such a good thing to remember. I’m sometimes at fault for letting too many things go through my mind during yoga, when a good intention-setting session beforehand would set me straight. Yes, love the leggings! Love this! Thanks, Beth! Thank YOU so much, Ashley! I really struggle with shutting off my mind during yoga sometimes, especially during corpse pose at the end. 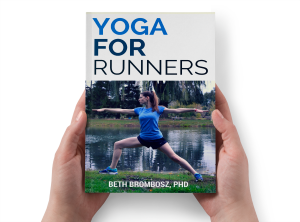 It’s the primary reason I keep practicing–I know the more my mind is going, the more I need my yoga! It’s just one more reason why I like yoga. Yes, right? Intention setting really does help deepen your practice. Hi Beth! Great post. Learning to set my intention is one of the differences between when I’ve tried yoga in the past and just didn’t get it compared to now. Now, I can’t imagine not doing yoga. Aw, thanks Jill, that means a lot coming from an amazing lady like yourself. 🙂 I’ve found that intention setting has really transformed my practice, too. A lot of the time I’ll set the intention to keep my mind as clear as I can or to relax and release and it really does help! Great Post! An intention is, quite simply, setting your thoughts on a specific goal or outcome. Setting intentions is a conscious way of keeping yourself from going through life on autopilot. You can set an intention each morning, before going for job, or even before you go to bed to guide your dreams. Thanks, Neil! You’re right, intention setting can be incredibly helpful, both in yoga and in everyday life. My yoga teacher who’s leading our training is GREAT about setting themes and intentions for class. It really helps me focus! Love it when teachers are able to tie in a theme to the entire class. One time I taught a class during a thunderstorm and used the storm as a metaphor for the class and it may have been the best class I ever taught. Tying in themes is something that I’m trying to work on more with every class.